This may help explain why, until now, youâ€™ve heard zilch about the Great Cambria Invasion of â€˜06. After all, for those police officers who participated, it would be best if the whole thing never really happened at all. Shortly after dawn that dreary Thursday, a raiding party of about 70 armament-sprouting, flak-jacketed cops from a variety of local, state and federal agencies descended on the now moribund Cambria Air Force Base. They were taking part in an aggressively-conceived search for a bunch of outlaws who reportedly were involved in a major crime enterprise by (A) operating a big methamphetamine laboratory; (B) violating parole; (C) printing bogus money; and (D) hoarding stolen automobiles. The raidâ€™s authorization was based, or so I am told, on information provided by a single informant. Undersheriff Steve Bolts disputes this, noting, â€œThe FBI had a parallel investigation going, and they opened theirs at about the same time we opened ours.â€? Anyway, the troops swept down on the base from every conceivable angle: packed into a string of patrol cars, undercover vehicles and armored assault units entering from Highway 1, on ropes rappelling down steep hills, in boats encircling the marine areaâ€”truly an exercise of well-trained professionals executing a carefully-crafted and detailed plan. No easy task, given the geography of the base. 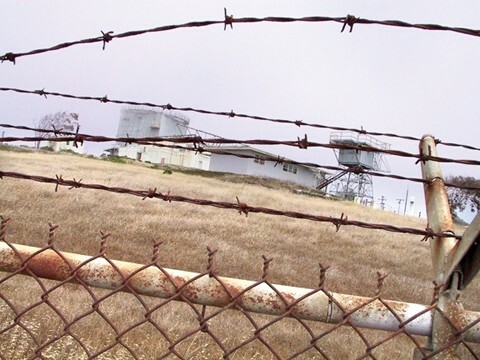 It originally was a 1950s-era surveillance installation, ostensibly secret, which used advanced-for-the-day technology to guard a portion of the West Coast against invading Reds during the early Cold War. Its location at the very westernmost edge of America, atop a craggy bluff overlooking the Pacific, gives it a sweeping perspective of the coastline and provided shelter from potential attack. The base has fallen on hard times in recent years, going through several private ownership changes and (for pristine coastal real estate) looking pretty haggard by the time the raiders launched their assault.Â Sheriff Pat Hedges himself arrived, chauffeured in an appropriately upgraded department vehicle, and assumed control of the search once the â€œcrimeâ€? scene had been properly secured. Then the drug enforcers, funny-money seekers and parolee hunters set to work. Officers swathed in toxin-proof cocoons scoured every ramshackle structure on the site, even utilizing a tank-like vehicle with a steel battering ram to knock down at least 10 doors, witnesses told this column. Drug-sniffing dogs prowled the property. Hour after hour, cops looked in, over, under, around, and through every room and object on the base. They poked. They dug. They scratched. They sifted through dirt and trash. They questioned the propertyâ€™s occupants, then questioned them again. Eventual take for the police? One grimy pipe of the kind sometimes used for smoking marijuana, half buried in mud in a little-used shed set well apart from any living quarters. The pipe apparently had not been used in years, and none of the tenants currently living on the base was found to have any connection to it. Three arrests were made for minor parole violations but all arrestees have already been released. Net gain for society on this day? Nada. The news here is not that the raid produced scant results. What I find interesting is that this kind of official juggernaut can be initiated by the simple act of whispering a whopper into someoneâ€™s ear. Or in my eraâ€™s gangland parlance, by â€œdropping a dime.â€? E-mail Daniel Blackburn at djblackburn@charter.net.